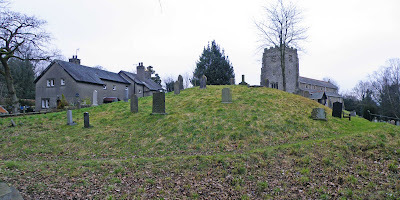 Here are the latest photos of the motte and bailey castle beneath the church at Whittington in Lancashire. 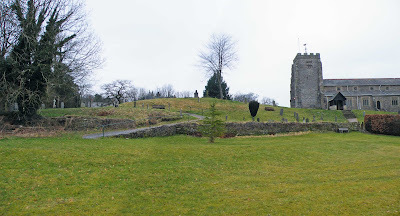 The photo above, shows the motte from the summit of the gentle rise upon which the church is built. This is looking West, with the church to my back. Another view of the motte, this time looking East towards the church. The motte is more pronounced from this view. It's tempting to see the footpath that runs around the bottom of the hill here (from left to right) as the ditch, though I think that any defensive ditches and banks were further down the hill. A great view of the motte with the church built over what is thought to have been the bailey area. All traces of this area of the castle, along with ditches and banks seems to have been obliterated over the years. A view of the motte from the path leading to the church porch. The motte can be seen steeply disappearing into the fields below to the left of the photo. Click on any of these images for a full screen view.